When my husband suggested renting a cabin in Flagstaff for a week I was more than a little concerned. All I could think of was: where are we going to eat. Flagstaff is not known to be a dining destination that's for sure. Don't get me wrong there are plenty of restaurants and brew pubs but not anything that would make you want to spend a week there. I started feeling better about things when my husband suggested that we cook most of our meals instead of eating out. I felt better still when I saw him packing some of our favorite cookbooks. We arrived in Flagstaff on Sunday afternoon; greeted by lots of rain and temperatures in the mid 60's. This was the perfect weather for making comfort food; an opportunity we don't get often living in Phoenix. So we made things like creamy tomato soup with grilled fontina cheese sandwiches for lunch and baked pasta for dinner. We also popped homemade popcorn and sipped on foamy mugs of hot chocolate. 2. 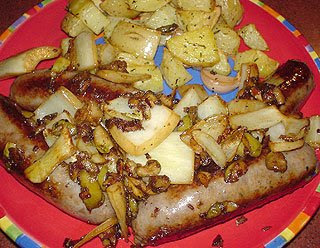 Sausage with Fennel and Olives from Lidia's Italy by Lidia Bastianich. Add the remaining 2 Tbs olive oil to the empty skillet. Toss in the garlic cloves and cook for a minute or so over medium heat until they're sizzling. 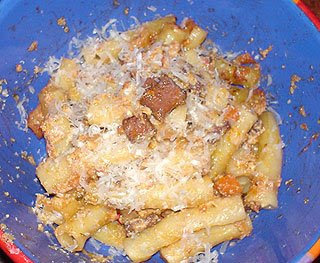 Drop in the pepperoncino then scatter the squashed olives in the pan. Toss and cook for a couple of minutes. Add the fennel chunks and stir. Season with 1/2 tsp salt. Cover the skillet and cook over medium heat for 20 minutes, tossing and stirring now and then until the fennel softens, shrinks, and begins to color. Add a bit of water to the pan if the fennel remains hard and resistant to the bite. All in all it turned out to be a delicious and fun week. Sausage with fennel and olives sounds like a delicious combination. It also sounds like good food for cooler weather which is just around the corner where I am. We actually stayed in Flagstaff for a couple of days when we visited the Grand Canyon and had some really good food. They were casual restaurants, but served fresh, organic food. Though your dishes sound perfect. so, i've been dying to get up to flagstaff since we got here...any recommendations on where to stay? From your post I see there won't be much to eat up there...but I like a good brew pub now and again. Thanks!